This serum provides advanced blemish and breakout control, and it helps your skin become brighter and clearer with every use. 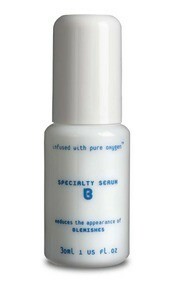 Oxygen Botanicals Specialty Serum B – Blemishes comes in a 1-ounce container. The product is ideal for people who have problem skin that is sensitive. It’s designed to meet the needs of people who have acne, oily skin, and combination skin. This serum acts as a cleansing agent with a built-in exfoliator, and it leaves the skin feeling soft and looking radiant. The texture of the skin becomes smoother after every application. The product comes in a bottle that is conveniently sized to be taken anywhere, so you’ll always have an effective cleanser available that combats breakouts. This product provides you with an assortment of advantages. It both cleanses and exfoliates the skin. Your skin will look and feel more vibrant and fresh with each application. The ingredients work to stimulate the healing function of the skin. The product eradicates an excessive amount of oil on the skin, and it helps to balance the level of oil that remains on the skin. The serum calms irritated skin, and it minimizes the appearance and effects of inflammation. It also works to remove the free radicals that may accumulate on the skin, and it helps to prevent further damage from occurring. The product fights acne, as well as other kinds of breakouts and blemishes. First, apply a cleanser and a toner from the same line of Oxygen Botanicals skin care products. Next, apply the serum on the face, throat, and chest in any places where breakouts are a problem. Give the skin several minutes to absorb the serum after application. Finally, apply a moisturizer and sunscreen. This product may be used up to two times daily, and regular application of the serum should result in a clearer and more vibrant complexion.